It's that time of the month where my store cupboards are running bare and while payday is just around the corner, yesterday I thought I would take stock and have a good look and see at what I could make from scratch from what I already had. This is a new phenomenon for me. I am a repeat offender of wasting food, quite often buying more fruit and vegetables than I need and then letting it go mouldy because I haven't planned any meals using them. I very rarely get through a whole loaf of bread before it starts to grow 'fur' as I don't like keeping my bread in the fridge and I've lost count of the amount of yogurts etc that I've wasted. So, it's time to get sensible and stop wasting money! Convenience foods have really got a lot to answer to for all this waste, and although I am not much of an offender of ready-meals (I don't own a microwave - the best decision I ever made...and it's easier than you think to live without one!) I very rarely cook everything from scratch - lets face it, who really has the time?! 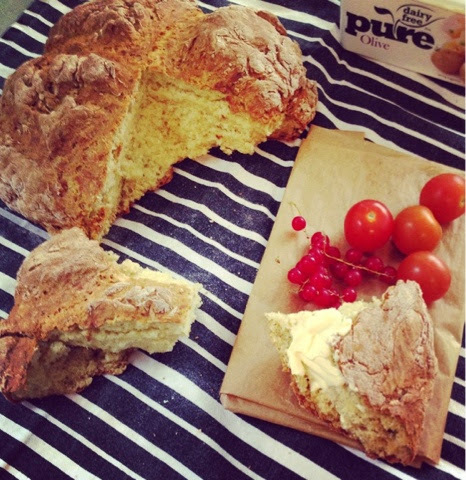 Well, yesterday I made one of the easiest, no-fuss breads you can make - Soda Bread. 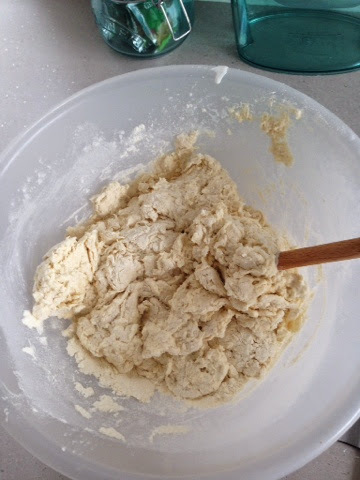 It's a myth that cooking from scratch has to take lots of time and planning and this traditional bread is a prime example - no yeast, no proving, no kneading - yay! So, what will you need...to be honest, the only thing I had to go out and get was buttermilk, some recipes use soured cream or live, whole fat yogurt - if you're being really thrifty, actual soured milk also does the trick! 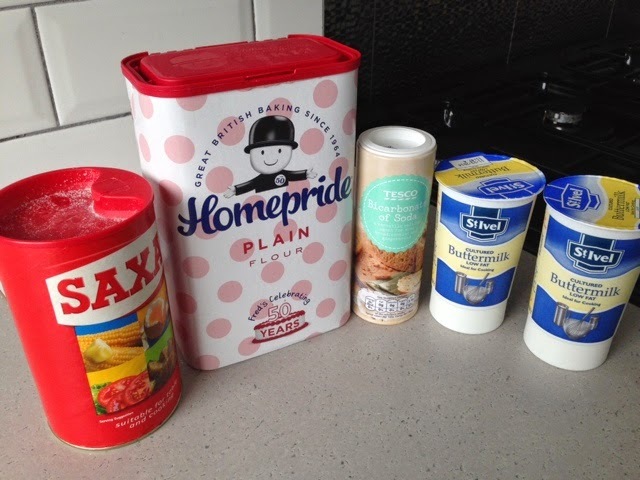 Also, it's your preference whether you use white or brown flour, I used white, but I think next time I will use brown for an even more wholesome and traditional taste. Preheat oven to 200C and place a baking tray in the oven to heat up. 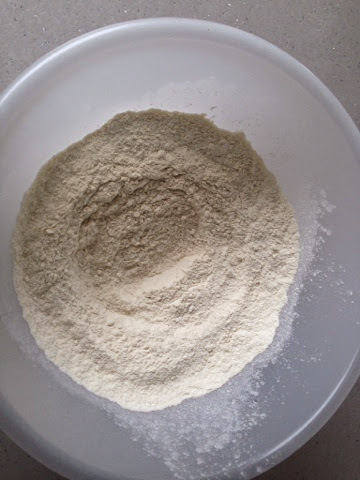 Place flour into a large bowl, then add 2 teaspoons of bicarbonate of soda and mix together. 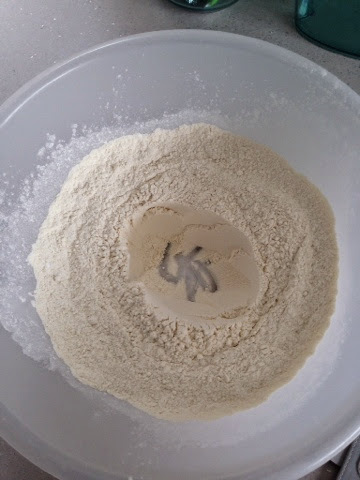 Stir in the teaspoon of salt and then use the back of a spoon to make a well in the centre of the flour. 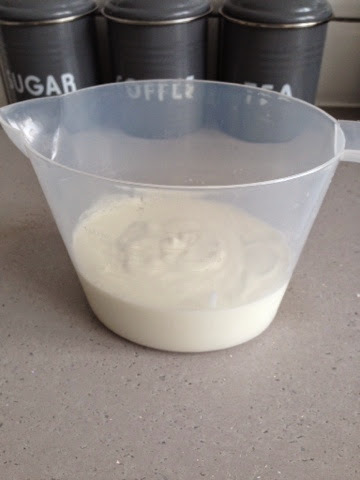 Measure out the 400ml of buttermilk and slowly pour into the flour mixing as you go. 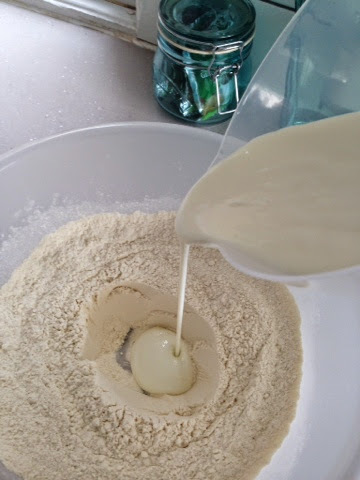 If the mixture still feels dry when it's all been mixed in, add in some milk a tablespoon at a time. The dough should be slightly sticky. 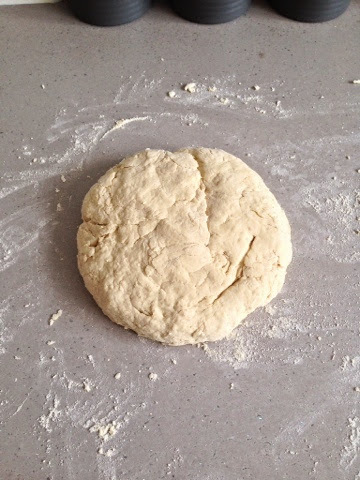 Tip the dough out onto a lightly floured surface and then shape into a round. The less you handle the dough the better as it could become tough. 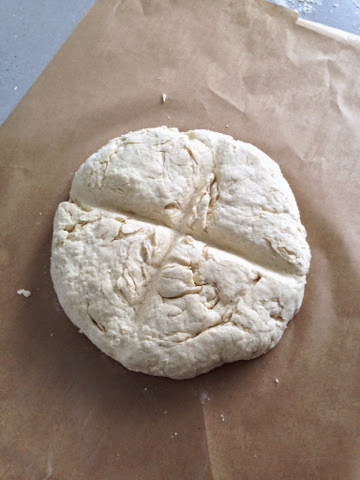 Transfer it onto a sheet of parchment paper, then firmly press the floured handle of a wooden spoon into the surface of the dough to get that distinctive soda bread cross! Slide the dough on its parchment paper onto the preheated tray and then put it into the oven to cook for about 40 minutes. 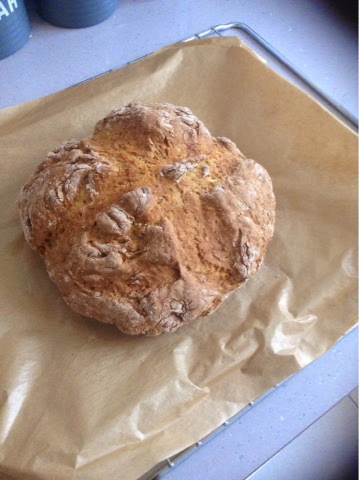 When cooked, the soda bread should be a dark golden brown colour and will sound hollow when tapped on the base. 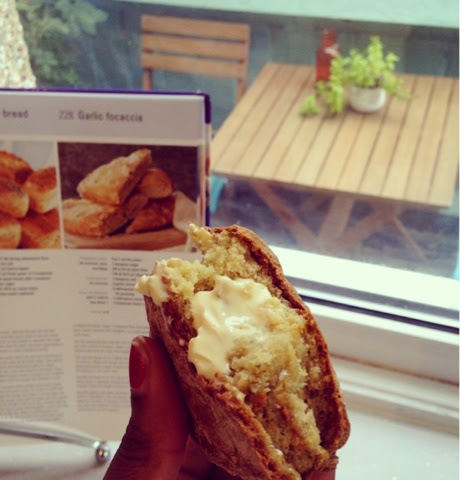 Break open and eat warm with some butter or jam - delicious! 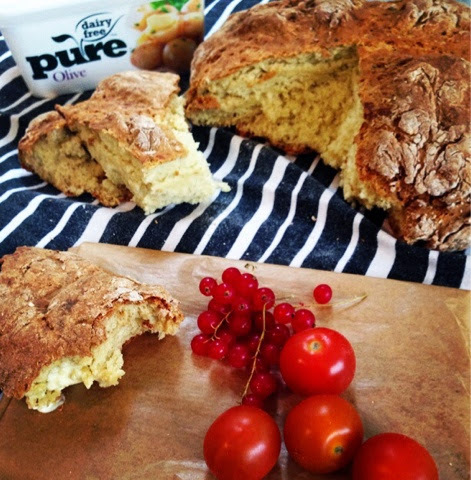 This bread was so yummy and I can't get over how easy it was to make. The whole house smelled of that delicious 'baking bread' smell, which is so cosy on a cold evening! I wrapped it up tightly in a tea towel after to store and it was still soft this morning for breakfast and absolutely gorgeous with a hot cup of tea. I was on a roll yesterday as I also made a homemade vegetable lasagne to go with my bread - I will share that recipe with you on here on another post.. Nothing better than the smell of butter on warm bread! wow this sounds so yummy! I will be trying this out tomorrow! Ahhh, glad I inspired you Kara! 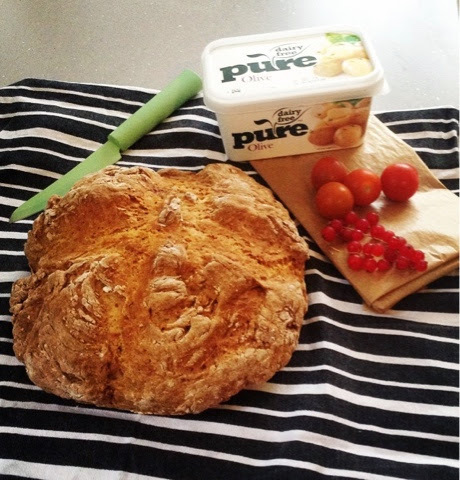 I was very proud of this bread - it tasted so homely!